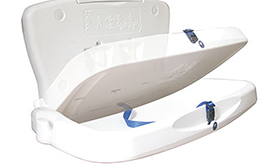 Many premises offer baby changing facilities, but a strong, safe and easy to use baby changing unit is crucial for the ease of changing and also the safety of the baby being changed. Envirotec can provide safe, durable and easy-to-clean commercial baby changing units for clients across Yorkshire and the East Midlands from our branches in Nottingham, Leeds and Sheffield. Safe, durable and easy to clean, a wall mounted horizontal baby changing unit can be easily folded away when not in use. Manufactured to high-quality standards vertical wall mounted changing units are ideal when you don’t have a wide wall space available. Compact and slim, strong, safe and durable. For more information about our wall-mounted baby changing stations, please get in touch with us today and we’ll be more than happy to help. Manufactured to high quality standards vertical wall mounted changing units are ideal when you dont have a wide wall space available. Compact and slim, strong, safe and durable.